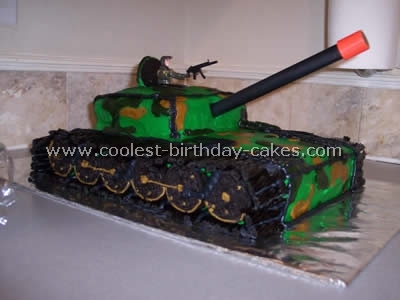 From ideas I got on this website I came up with this army cake for my son’s sixth birthday. I used a 9×13 cake pan and split the 9×13 cake recipe into another a smaller pan for the top. Once cooled I cut out a bit in the front and back for some shape, iced it all green adding Oreo cookies for the wheels and lid on top and some brown icing for detail. Then I used some spray colour (black and green) to give it a bit of a camouflage look. In order to complete the cake, I used a couple of figures from my son’s play set and the finished product was a hit! I am so excited to find your website! I was inspired by your website for the army cake! One thing that was tricky was finding the right color for the tank. I want to say that it takes a lot of green and brown coloring to get that perfect “army green”. I used a large sheet cake pan and placed it on a board covered in wrapping paper. Then I placed a 9×13 cake on the top. I used a loaf pan for the cake on the back of the tank and baked an additional cake in another loaf pan cut into a circle for the top. Then, I cut the front of the large cake off meeting up with the other cake and sliced in a downward effect to give it a slope in the front. I did the same with cutting at a slope on the back loaf size cake. I covered in the green frosting with a knife dipping in water occasionally to prevent cake sticking. Then, I covered the rest with a tip. With combined ideas from your site for an army cake I used black licorice and Oreo cookies for the track and Oreo for the hatch. I glued a flag sticker to a toothpick as well to go with the army guy coming out of the hatch. I received so many compliments and made sure to give a “shout out” to your website for all 35 guests. Also, I decorated a camouflage sheet cake from your sight as well, however using different color combinations. You made my twin 10 year olds birthday a memorable one! Thank you! 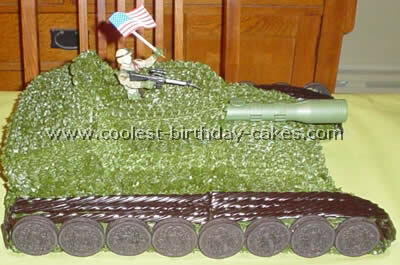 I got this idea for the army cake on this website. I used a 9 x 13 pan for the bottom of the tank and a loaf pan for the top. To get tan icing I used vanilla frosting and stirred creamy peanut butter into it. For the wheels I used Oreo and for the treads pieces of Hershey bar. For the cannon I just rolled up a piece of brown construction paper and stuck it in the cake. I finished by spraying with green cake paint sprinkling, crushed up Oreos around it (dirt) and decorated with little flags and army men. For my son’s 9th Birthday he wanted the whole Army/Military theme. 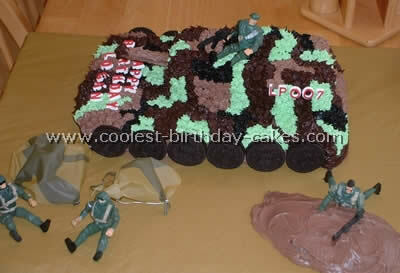 So to make it all the more authentic I decided to find an army cake to fit the theme. 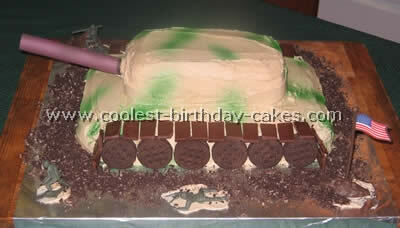 I ran across this site and saw all the different variations of the Army tank cake and decided to take bits and pieces from each to make my own. My 15yr old daughter is really the one that did all the baking. She used a 9×11 glass dish for the bottom of the tank and a glass loaf pan for the top. Put it in the deep freezer overnight to make cutting/sculpting easier. She iced the whole cake with whipped white cream cheese icing. She then used a green colored icing spray and colored the whole thing, spraying heavier in some areas than others for a more camouflaged look. I used the computer and printed the US Army and DH009 cut it out and stuck it into the icing. The flags were also computer generated. My oldest son created the license plate on the army cake. We used Oreo cookies and Hershey’s special dark chocolate bars for the tires and tracks. The opening behind the army guy is another Oreo, the headlights are skittles. I snapped the legs off of an army guy then glued toothpicks in their place to keep him in place without creating a huge hole in the cake and glued the bazooka and grenade into his hands. The big gun is actually the telescope from a toy gun which I gut off and glued toothpicks to and stuck it in the front of the cake. As you can see I love my hot glue gun. Our army cake turned out pretty nice. To top it off she laid a layer of chocolate icing around the cake then crushed Oreos and Nilla wafer cookies for the dirt and used some army guys to finish the whole thing off. All of the kids and adults at the party were impressed and she (my daughter) was really proud that she had made such a masterpiece. 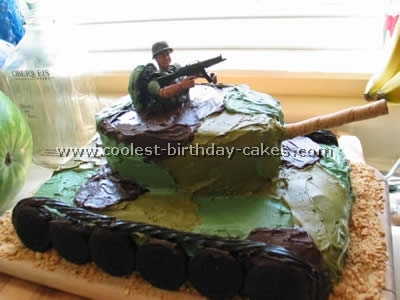 I did this army cake for my son’s joint 7th birthday party – we took them and their friends to a tank party – they got to have a ride in a tank in a 4 x 4 over a very muddy field and had a go at archery and bebe guns. My brother in law is in the army so I decided to have a go at doing his actual tank as well. 3. Bake/buy some chocolate marble Madeira cake – I bought it this time because the brick shape you can buy them in made life a lot easier and it still took a week to make. I used eight brick sized cakes for this army cake. The recipe I used for chocolate marble Madeira cake is Debbie Brown’s one from her books – it tastes great and is nice and firm for carving. 4. You’ll also need plenty of butter cream for covering the cake so that the icing will stick to it and to keep it nice and moist between the layers. 6. 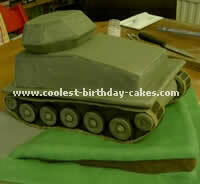 Carve three of the cakes into the hull of the tank I used photo’s we had of a Scimitar tank (my brother in law’s tank). Whatever tank you do try and get images from all sides to help with the details. Then roll out pieces to cover the hull using sugar glue to join the edges up. You can’t have enough sugar glue, its marvelous stuff. 7. Make the wheels by cutting your circle and then doing a dimple in the middle and put two much smaller circles in the middle of that. Let them dry nice and hard. I used a circular cutter with icing slightly too thick to get a double circle imprint which was handy for the rubber tires. 8. The tracks were a pain, roll the icing out really thin and then indent with a ruler or the back of a knife – very carefully put on the hull, it may well break but don’t worry it’s easy to place them on and the glue will hold it together. Once they are on the army cake you can paint them with black sugar paste coloring (dilute a little with some white alcohol to thin it slightly – the alcohol evaporates so no one will get drunk). Stick the wheels in place with sugar glue. 9. You will need a board to sit on top of the hull to help with the weight and support of the cake. Cover it with foil and then ice it over with the olive green sugar paste. This will need to be secured in the hull cake by using plastic dowel rods that go into the bottom cake through the board and up into the next cake. 10. Carve and cover your next bit of tank body and then carve and cover the turret. 11. You can then start modeling all the bins on the side of the tank. The two rear bins are cake ones the rest are solid icing. 12. Once all your bins and detail is done you can start with the camouflage paint job – again dilute a little black sugar paste coloring and have fun with it. Leave it to dry. 13. The cannon – this is a plastic dowel road painted with black sugar paste coloring plus a little silver dust then a piece of olive icing was rolled around one end and some black shaped for the muzzle. A hole was drilled very carefully through the icing and the dowel pushed in again very carefully. I made this army cake with one rectangle pan and a loaf pan for the top. 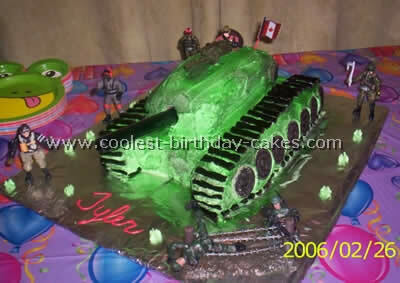 Then, I covered it with green icing and I used spray icing to make the camouflage effect. I used Oreos for the wheels and cut licorice for the tracks. I also slid some licorice under the cake to make it look like the track was all the way around. Made the flag with stickers and a toothpick and got some army guys to put all around. I used the end of a telescopic play toy for the turret. The cake was a huge hit with the kids even the girls. 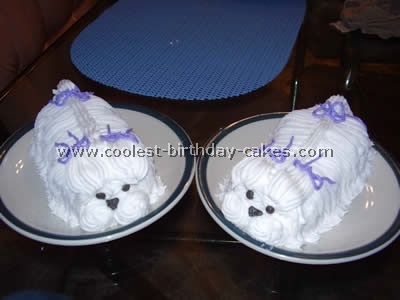 I looked to this site for some help with an army cake and just wanted to share what I came up with. It was so much fun. I baked a large sheet cake and one loaf cake for the army cake. I dipped a pretzel rod in chocolate. In order to make the dirt and wheels, I used Oreo cookies. 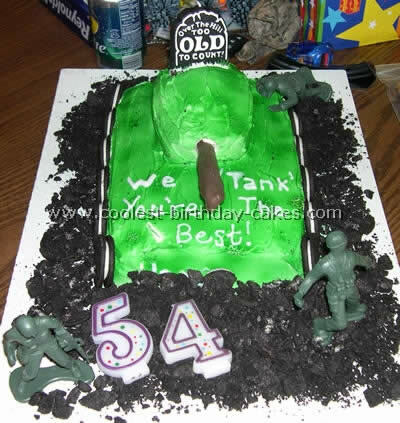 My father-in-law was quite surprised when his grandkids surprised him for his 54th birthday with a tank cake. Simple and delicious! I made this army cake for a birthday party where I used a whole camouflage theme for the table as well. 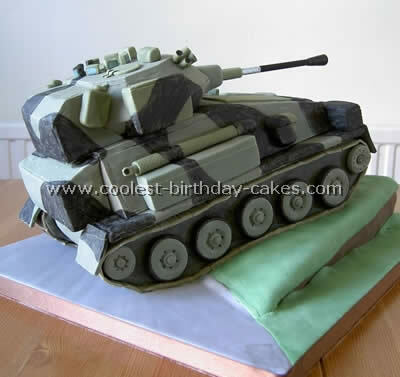 The army tank cake seemed to be the perfect fit. The bottom portion of the cake was a 9×13 pan and the top was portion is a loaf pan. However I cut the loaf shape to make it more exact and slanted in the front. I got the camouflage effect by coloring the icing with green food coloring and then using the darker spray icing in spots. I used Oreos for the wheels and Hershey miniatures for the treads. For the cannon, I used a Pepperidge Farm Pirouette cookie. In order to achieve the rough terrain effect, I put crushed Oreos around the tank. I frosted an Oreo for the hatch portion and placed a plastic army man there. The cake was enjoyed by all! I used a 9×13 glass pan to make the bottom layer and then I used a loaf pan to make the top layer of this army cake. Also, I made cupcakes and used one of the cupcakes to make a lid for the top of the tank. I used Oreo cookies on the side for wheels and I used a large pretzel covered in icing for the cannon. I used chocolate icing chocolate icing and white icing mixed white icing tinted with green food coloring and black icing to make the camouflage pattern. Then, I put the child’s initials on the side of the cake and he was seven years old so I used the number 007 but I didn’t think about James Bond when I did it. Some thought it was intentional but I didn’t even think about it! Finish off the cake with army guys. I purchased mine at a store for a couple of dollars. 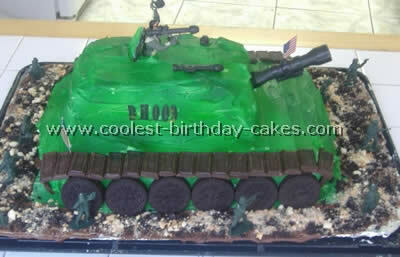 The little boy loved it and he had some jealous cousins who really like the cake and I had fun with this army cake. My son wanted an army party for his 8th birthday. So, I used a large rectangular pan for the bottom and an oval pan for the turret. The treads on the tires is molded chocolate (I used a fence mold). 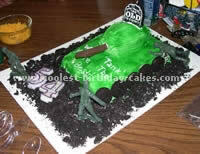 The army cake was iced in an army green color and I used spray color green and black to create the camouflage look. In order to make the wheels, I placed full sized peppermint patties. As a result, it was one of the easiest cakes I have ever decorated! I made this army cake for my son’s fourth birthday which was an Army boot camp themed party. He loved the action figure coming out the hatch on top. 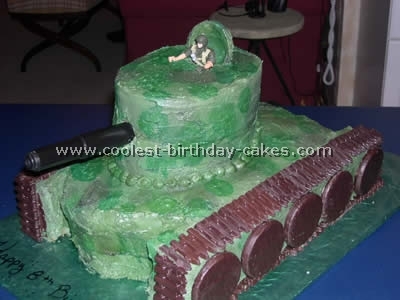 So, I made the army cake using a 9×13 and a loaf pan trimmed to make the top look like a tank. Take Oreo cookies for the wheels and wrap them in black licorice for the treads. Cover an Oreo cookie in green icing on the top side for the top hatch. (I snapped the bottom of the inexpensive action figure off and pushed the top half into the cake). The barrel is a Pirouette cookie. 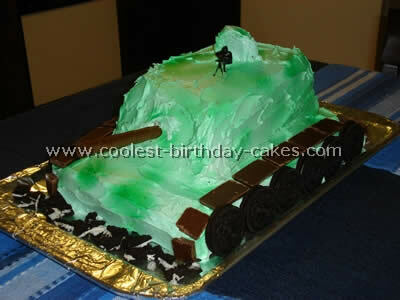 It is a bit tricky to get the Army camouflage colored icing right. Use chocolate and then tint vanilla with different mixes of green, yellow and red to get this effect. For candles I used sparklers on each of the four corners. My son thought the firing cannon was great. Instead of singing “Happy Birthday” we chanted a birthday cadence. 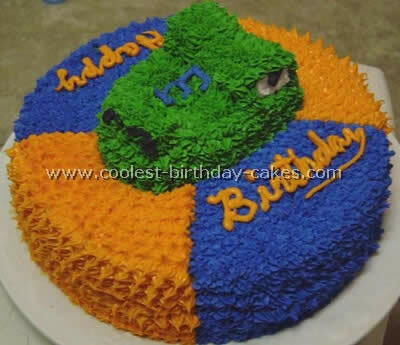 This was an army cake I initially got ideas for from this site. We made it for our friend Anthony’s son’s 3rd birthday. Both my boyfriend and our friend are Operation Iraqi Freedom Veterans (Army). 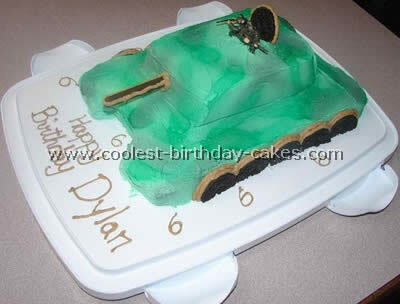 The tank army cake itself is Devil’s Food (two batches of batter, the turret is two small loaf pans, the base is two layers made from a medium-sized sheet cake pan). We used Oreos for the wheels and cut up Twizzler licorice for the tracks (using icing to secure each piece). The icing is all homemade buttercream with different tints of Wilton food coloring as necessary. I baked the cake Friday night and then put the base green coat of icing on Saturday morning. Saturday evening Anthony and I both started working on the details pulling from his military experience with actual tanks. We used our imagination for the rest. We didn’t finish until close to 3:30 Sunday morning. The item that posed the biggest dilemma for us was the cannon. My boyfriend and Anthony went to a dollar store and bought a toy riffle that they cut down to size to use for the cannon about 20 minutes before the party started Sunday afternoon. All pieces of the cake were edible except for the army man, his gun (both also found at a 99 Cent Only Store), and the cannon. 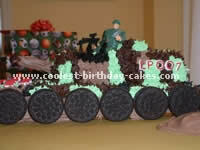 All details with the exception of the inedible pieces: tracks, wheels, and cover behind the army man (which was an Oreo pulled in half) were done with Buttercream icing. So, here’s how to give the camouflage a more “painted-on” look. Carefully press down on the icing as it dries, using fingers and paper towels to make it look smoother. When we were ready to put the candle on for the party itself we just removed the army man (who was legless by the way for easier application to the cake) and inserted the “3” candle in his place. Anthony Jr., his mother, aunt, grandparents, friends, and my boyfriend (“Uncle” Chace) were all impressed. In addition, I’m proud to report; even though we thought we might shed a tear or two when the cutting of the cake took place I’m proud to say we both held our composure together with only a slight whimper or two. 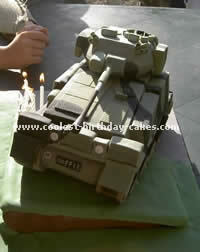 Most important, the kids loved the tank army cake, and that was our biggest goal accomplished.